Recently, the AMS and UBC leadership underwent negotiations to eliminate the support services at the SASC — without involving the SASC staff, and without consideration of the survivors currently accessing services. We, at the SASC, were devastated to learn about this decision on Friday, June 8 from AMS leadership. The SASC has been given only 83 days notice to end its support services. 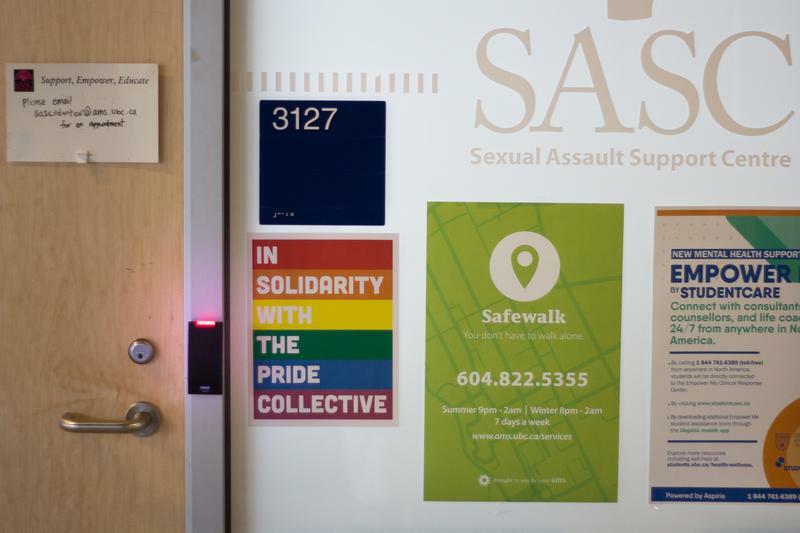 The AMS Sexual Assault Support Centre (SASC) opened 16 years ago to support survivors, students, staff and faculty and to prevent sexualized violence at UBC in response to sexual violence on-campus and the absence of any resources to support survivors. The SASC has been a vital resource on campus, providing support to the university community, including students, faculty and staff in a way that meets their unique needs by being trauma-informed, intersectional and survivor-centered. The closure of SASC support services is not trauma-informed nor survivor-centred, and undermines the legacy and experience of 16 years serving survivors on campus at the SASC. At the SASC, we take a collaborative approach to how we provide support services and work together as a team and with survivors, and we want to ensure that survivors have options and choices to the types of support they receive. "The closure of SASC support services is not trauma-informed nor survivor-centred." The SASC has worked tirelessly to reduce barriers for survivors, including working with Vancouver Coastal Health’s Sexual Assault Service in 2016 to bring forensic exams to the Urgent Care Centre at UBC Hospital. At that time, there was a funding request to the university to support the increase in SASC staffing to provide accompaniments to those wishing to access the service. This funding request was denied by the VP Students office. We have collaborated with UBC staff and faculty through workshops, individual consultation and collaboration — there is amazing work being done at UBC by staff and faculty who are trying to make their work more survivor-centered. In addition, the SASC is currently the only place on campus that provides space for those who have perpetrated violence, and who want support in striving to do better and to do accountability work. Recognizing the importance in breaking down the cycle of abuse is integral to support work as it recognizes the impact that violence can have on perpetrators as well as survivors. This work is nuanced and complicated. Without support services in the SASC office, this leaves no drop-in supports for those undergoing accountability processes, be they constituencies or individuals. We recognize the strengths and good intentions of the Sexual Violence Prevention and Response Office (SVPRO) and have been interested in collaborating with them since their arrival on campus in October 2017, while being adamant that a partnership cannot function if we are not equal partners. We believe that SVPRO cares about survivors and that they have different strengths and capacities than the SASC, but we still believe the decision they have been a part of, to eliminate SASC support services, will limit options for survivors, and in turn will be harmful. "Despite the important work they are doing, SVPRO is, by definition, limited by working within a system that is designed to protect the reputation and liability of UBC." Despite the important work they are doing, SVPRO is, by definition, limited by working within a system that is designed to protect the reputation and liability of UBC. This makes it difficult to truly support in a survivor-centred way. Over the years that the SASC has provided support at UBC, our independence has allowed us to keep the needs for survivors at the centre of our work in a way that an organization beholden to the university would not be able to. Jurisdictionally we have significant differences in who the two centres support and under what circumstances. The SASC will support anyone who walks through our doors. As an anti-violence organization, we understand the intersectional nature of power-based violence and believe it is inherently violent to turn someone away who is reaching out for support because of something so arbitrary as the colonial definition of geographical location the violence took place. We have seen UBC staff and faculty bring students to the SASC when they know that it will not fall under the jurisdiction of a UBC’s Policy 131; they care for their students and want to ensure they can find the support they need. The work we do is inherently political. Just like CiTR or The Ubyssey, we need to be able to do it in an unbiased way. We feel that by ending support at the SASC without centring survivors and staff is indicative of a wider attitude of the AMS on grass-roots organizations. The stress put upon SASC by these AMS actions has detracted from the resources he have to do this work. Replicating colonial, judicial systems within universities is not the only answer. There needs to be different and more nuanced approaches that give more choice to survivors in navigating these situations in a way that makes sense and allows for the context in which this violence occurs to transform. If you believe as we do that the loss of support at the SASC support services would be a significant set-back to the community, we ask that you stand with us. Stand with us for survivors’ right to choose and stand with us against lateral and institutional violence. "If you are a survivor, please know that even after August 31, we will still strive to work alongside you in whatever our new capacity." Here are some ways you can help save the SASC: please share this article and get the word out about UBC and the AMS making these unilateral decisions without centring the needs of survivors. Tell the UBC Board of Governors and the AMS Council you stand with the SASC and support choices for survivors. Tweet them at @AMS_UBC and @UBC using the hashtags #SaveTheSASC and #ChoicesforSurvivors, email, phone and show up to their meetings to voice your concerns. We call on the UBC Board of Governors to update Policy 131 in order to add the SASC as a key partner to collaborate with to meet the needs of survivors, in relation to point 2.2 of said policy. Share your stories of healing, stories of support, stories of institutional failures and violence. We want to hear your experiences in your own words. Direct Message twitter account @SaveTheSASC and we can tweet your story anonymously or tweet @SaveTheSASC to share the impact the SASC has had on your life or the lives of those you know. Stories can be shared anonymously by emailing ubc.sasc@gmail.com. If you are a survivor, please know that even after August 31, we will still strive to work alongside you in whatever our new capacity. If support is something you are seeking, know that we will work to find new ways to ensure that if you are reaching out, someone has been reaching back to meet you.